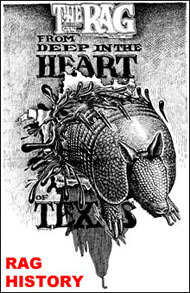 Editors Thorne Dreyer, Alice Embree, and Richard Croxdale are featured in a booksigning event at H-Town’s storied Brazos Bookstore. Top, from left: Celebrating The Rag editors Thorne Dreyer, Alice Embree, and Richard Croxdale. Photos by Alan Pogue. 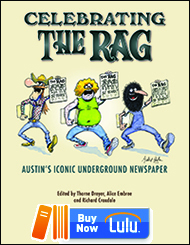 When: Thursday, May 18, 2017, 7 p.m.
HOUSTON — The editors of the acclaimed book, Celebrating The Rag: Austin’s Iconic Underground Newspaper, will speak, lead a discussion, and sign books at Houston’s storied Brazos Bookstore at 7 p.m. on Thursday, May 18. Brazos Bookstore, a Houston literary hub since 1974, is located at 2421 Bissonnet Street in Houston. 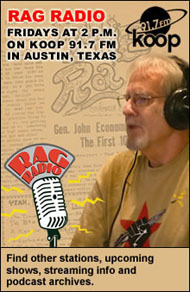 Celebrating The Rag, published by the New Journalism Project and designed by Carlos Lowry, tells the remarkable story of the legendary underground newspaper that sparked a political and cultural revolution in Austin. The 300-page book features more than 100 articles from The Rag’s 11-year history (1966-1977) — plus contemporary essays and eye-popping vintage art and photography, including Gilbert Shelton’s fabled Fabulous Furry Freak Brothers comic strip, which started in The Rag, Jim Franklin’s surrealistic armadillos, and classic photos by renowned documentary photographer, Alan Pogue. 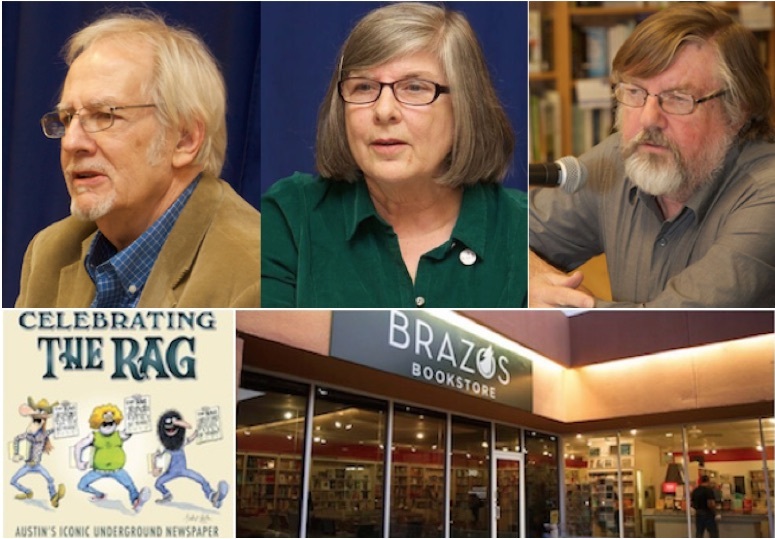 At the event, the editors will also discuss The Rag‘s significant impact in Houston — and the Bayou City’s ’60s-’70s culture wars with right-wing vigilantes. Night riders identified with the local Ku Klux Klan blew KPFT-FM, Houston’s Pacifica radio station, off the air, and terrorized Space City!, Houston’s underground paper that was founded by former Rag staffers, with bombings and drive-by shootings. 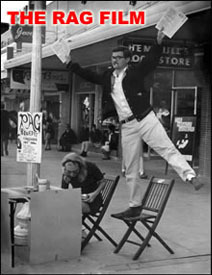 This entry was posted in Metro and tagged Alice Embree, Booksigning, Brazos Bookstore, Celebrating The Rag, Houston, Metro Bloggers, Rag Bloggers, Richard Croxdale, Thorne Dreyer. Bookmark the permalink.